When the weather becomes crisper and the leaves start falling, our skin becomes more susceptible to dehydration and can start to look a bit lacklustre. Your skin might also become more sensitive and notice heightened redness or irritation as the temperatures drop. To remedy these concerns, we recommend using super nourishing products, which offer a good dose of nourishment and hydration to the skin and blend soothing, cooling and calming ingredients. 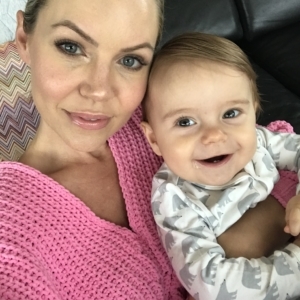 We spoke to Perth-based Influencer and super-Mum, Amy Zempilas to get the scoop on how she supports her skin (and keeps it looking beautiful) during this season change. What does ‘wellness’ mean to you? For me, wellness is being happy, healthy and strong. I need lots of energy to take care of my three gorgeous and energetic kids, so I have to make sure I take good care of myself. I do Pilates a few times a week, make sure I eat nutritious food and drink lots of water. I’ve also become much better at listening to my body and resting when I need to. It’s also really important for me to look after my skin, as it’s one of the first things that suffers if I am tired or run down. As a Mum, what daily wellness practices do you incorporate into your everyday life? Most days, I wake up before my kids and really enjoy having a coffee and quiet time. I try to find 5 – 10 min a few times a day to have time to myself – sometimes I will sit in my car before school pick up and listen to some relaxing music. I also have a beautiful cleanse and moisturise ritual for my skin every morning and evening – I can’t live without my Sodashi moisturiser! What are your beauty tips for Autumn and how do you switch up your beauty routine during this season? When the weather becomes cooler, it’s easy to forget to drink water – so I carry a water bottle with me wherever I go to stay hydrated. I always have a jar of Enzyme Face Polish in my shower and exfoliate once or twice a week – it’s like a mini facial in a jar, and it’s so easy to use after cleansing. I apply, leave a minute for the enzymes to get to work and then massage gently for granular exfoliation. It leaves my skin with a gorgeous glow. I’ll also keep my skin soft and smooth by using the Calming Face and Neck Moisturiser, I love it! It’s so gentle and luscious and has a delicate Rose aroma. And a few nights a week I will use the Holy Grail of Sodashi skincare – the Samadara Ultimate Age-Defying Elixir. I pop a few drops on my face, lips and décolletage before I go to bed and wake up with fresh, hydrated, soft, clear skin – my skin drinks it up! Which Sodashi product is your ultimate Autumn must-have? It’s so hard to choose just one, I have so many favourites! But if I had to choose – it would be the Samadara Ultimate Age-Defying Elixir. It’s been my greatest age-fighting defence over the last few years of sleep deprivation and I can’t recommend it highly enough. It’s also beautiful when layered under your moisturiser for a dramatic hydration boost. Amy Zempilas is a Perth-based lifestyle blogger and super-Mum. To find out more or to read her blog, Absolute Amy click here.